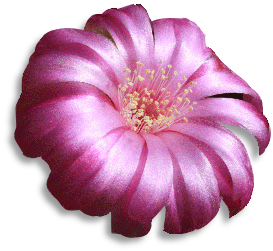 Note that the genera Sulcorebutia, Weingartia and Cintia are all considered as parts of a large genus Rebutia in this classification. You will notice that just a few species left. How does it come that all those species disappear or at least are lumped under other species ? I think that it is due to the big gap between the point of view of a collector and a purely scientific point of view. First of all, let's try to understand what is a species. There's a population of Sulcos showing black spines on Hill A. On Hill B another population (fertile with the first population) showing yellow spines. The term intergrading means that we will find between those 2 hills sulcos with black spines, sulcos with yellow spines and sulcos with spines of both colors together (and of course fertile with each other). Ideally there's on Hill A 100 % of Sulcos with black spines ; on Hill B there's 100 % of Sulcos with yellow spines ; and between both Hills there's a progressive variation from black to yellow. The idea of this definition of "species" is that there must be interfertility between populations and distinct features not limited to one population, but shared by intermediate populations. This was the scientific approach. And what is the idea of species for the collector ? David Hunt says : "For anyone growing or collecting living plants, the desire for the names to be precise and constant is paramount. In essence, and justifiably, the approach shoud be that of the nursery-man's catalogue - so as to be able to specify exactly the plant one has, or is looking for, or is talking about. For every item that looks different or behaves differently, a different name, and the simpler the better, is what is needed." Indeed, if you refer to David Hunt's classification, you'll have to label your R. caracarensis, R. inflexiseta, R.crispata, R. rauschii et R. pulchra with only one name : R. pulchra. Even if this is scientifically uncorrect, I think that using "older names" in a collection can give some order to it (if no real classification) and the field number indicates exactly the plant one is talking about.